Michele Hill’s Beatrix Potter quilt is now on display in Hill Top, Cumbria. This blog  posting comes from C&T Publishing who published, Michele Hill's beautiful book entitled:  'Stitching with Beatrix Potter'. Posted by Deirdre Quirk on March 23, 2017. Because of my love of the designs of William Morris, and then my William Morris in Appliqué books, in 2012 I was invited by Helen Bertram of Whitecroft Tours in the UK to accompany tours in Britain. Helen and I escorted six sold-out William Morris tours from 2012 to 2016, and it was through this association that I discovered that Helen had been a Chairman of the Beatrix Potter Society. Our mutual love of Beatrix Potter resulted in many conversations, and Helen finally persuaded me to write the book Stitching with Beatrix Potter. While I was doing my research, Helen suggested (well she actually told me I had to!!) do a version of the quilt on Beatrix Potter’s bed at Hill Top. So I emailed the National Trust to get photos and permission, but I did not hear back for quite some time. I started to worry about time and my book schedule, so after a bit of my own online research I found a photo of a simple green and pink patchwork quilt on the bed at Hill Top. 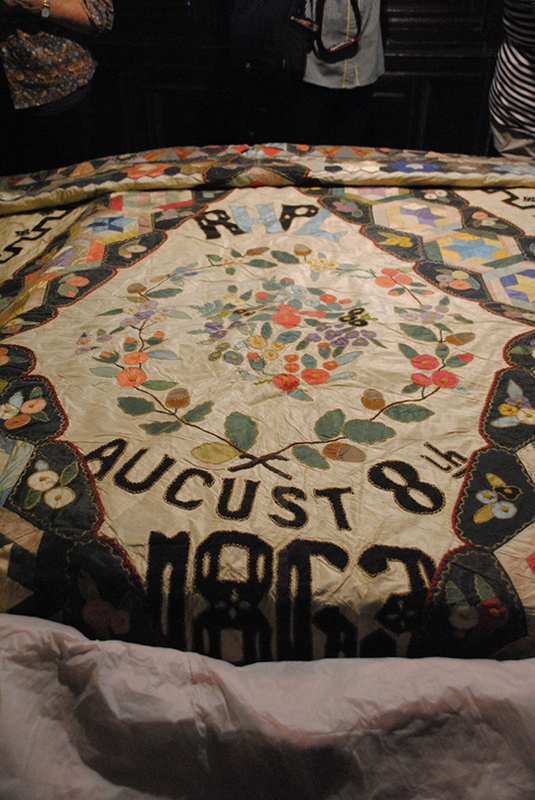 Above: 1863 wedding quilt from Hill Top. Imagine my surprise when I finally heard back from the National Trust and the photos were of an entirely different quilt … the 1863 wedding quilt. So my task was a lot more daunting—and I only had a photo and no measurements! 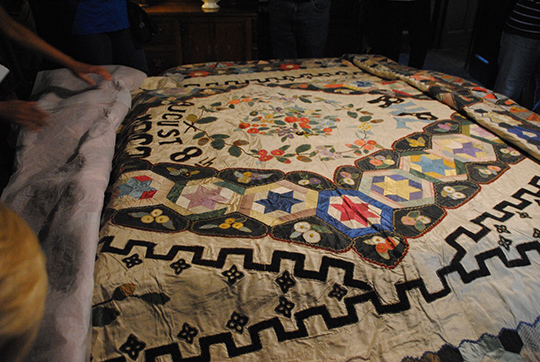 Not much is known about the quilt except that it belonged to Beatrix Potter’s parents, Helen Leech and Rupert Potter. It is thought that Beatrix’s mother, Helen, might have stitched this very special quilt with friends for the occasion of her marriage to Rupert in 1863. 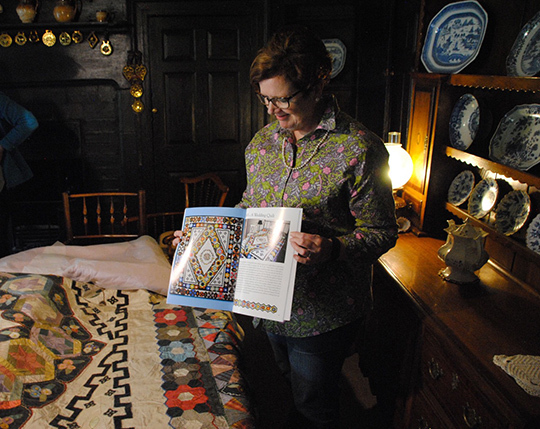 The original quilt is very fragile and is rarely seen, so I felt very blessed to have been given permission from the National Trust to reproduce it. I didn’t actually see the quilt in person until after I had completed mine, so it was a very special moment when I finally did. The quilt is made from velvets, silks, and cottons and is hand appliquéd, hand pieced, and hand embroidered. The above photo is of me finally seeing the original last year in September. Helen put on a special Beatrix Potter tour in the UK to launch the book and that story is on my blog here. After I finished the book, my version of the quilt was left simply sitting on a shelf. It was not something I felt I would use in my own home, and it seemed such a waste to have it stored in my wardrobe, so one evening in November 2016 I emailed Liz Hunter MacFarlane, the House & Collections Manager of the National Trust South Lakes, which manages Hill Top. The response I received from Liz was overwhelming—I did not really think they would be interested, let alone want to put it on display! Liz’s response to my email was as follows: “How can we possibly thank you for such a wonderful gift—you are so, so talented, and we are so fortunate to have the opportunity to share your work with our visitors. You can imagine how my heart burst reading that! Although I sent the email in November, the quilt wasn’t posted to the UK until February 2017. 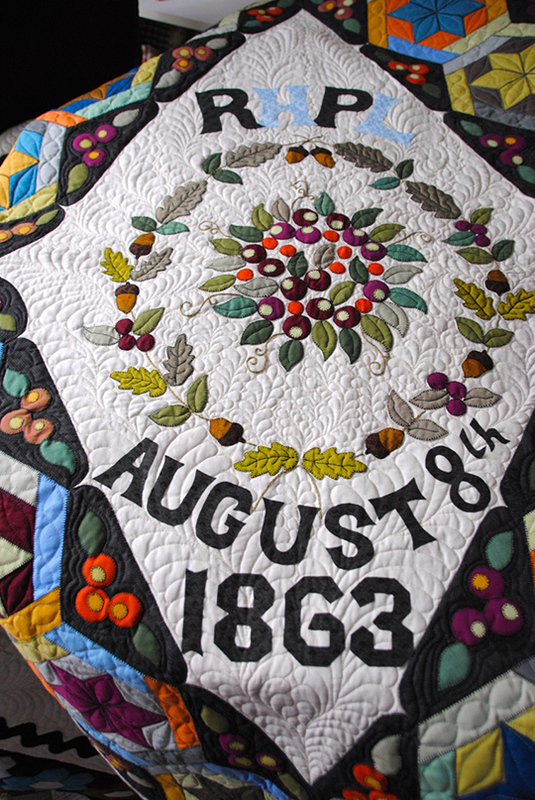 When I made my reproduction version of the quilt I did not include the appliquéd 1863 wedding date and initials of Helen Leech and Rupert Potter as I felt this wasn’t appropriate for a wider audience. So before I sent the quilt to the UK I decided to hand appliqué the letters and date to replicate the original quilt. 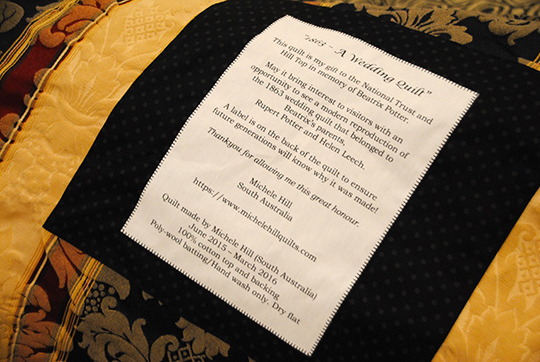 I have not yet been back to the UK to see the quilt, but I am hoping to receive photos soon! I feel incredibly honored to have a piece of my work displayed at Hill Top, where it will be seen for many generations to come. I made sure I stitched a label on the back of the quilt explaining how it came about too! 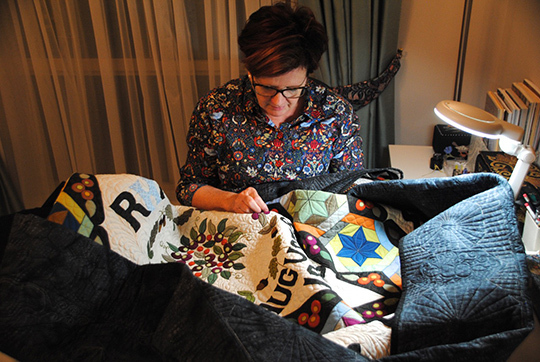 I was introduced to the wonderful world of quilting in the late 1980’s when I was looking for a diversion from my role of motherhood and part-time nursing – the rest as they say is history! This hobby has led me to amazing opportunities that I never expected and it is through my love of applique and William Morris that most of this has come about.